I think we can all agree that life in Singapore is pretty fast-paced. Sometimes we are so caught up with everything in life that I wished I had more hours in a day so that I can do the things that are more fulfilling - like spending time with my adorable monkies. Yes, I'm biased that way. But truth is, they are growing up way too fast for me. So anything that aids me in freeing up time for them is always welcome. 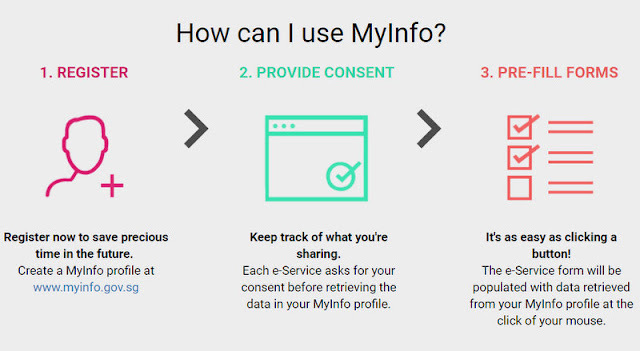 Something that a digital service called MyInfo promises to do. Hands up if you are one of those who dreads filling and re-filling personal information for online transactions. I, for one, find it a hassle to keep providing the same information such as NRIC, address and contact number over and over again. Compared to the time I first registered for the Baby Bonus when Ash was born in 2005, the convenience of filling up my personal details now is definitely welcomed. Back then, I remember having to fill pages of hard copy forms and when it came to Ale's turn, I still had to fill in every single detail all over again even though the medium had shifted online. That is why MyInfo is such a lifesaver - if you transact online with Government agencies. Simply put, it is a personal data platform that enables seamless digital transactions by auto-filling data fields upon your consent. So no more filling in the same data for separate transactions with different government agencies! FREEDOM! What this means is the digital service allows fields to be automatically filled with data - such as name, NRIC number, registered address and property owned - pulled from various government agencies such as the Immigration and Checkpoints Authority, the Inland Revenue Authority of Singapore, and the Urban Redevelopment Authority. As I found out, signing up is a breeze. I effortlessly registered for a MyInfo profile at www.myinfo.gov.sg using my SingPass account. Once registered, my basic profile was created with personal information from participating Government agencies within 1 working day. And as an added security measure, I had log in via an additional 2FA mechanism, which provided protection to safeguard the data within my profile. Once signed up, I can then choose to enhance my basic profile by providing additional details such as my highest education level or family relationships for even greater convenience during future transactions. So the next time I transact online with a Government agancy, there is NO need for me to tediously fill any more online forms if the information had already been captured previously. Now, all I have to do is to click the ‘Retrieve MyInfo’ button located on these online forms, and the participating digital service will be able to receive the necessary data fields from my profile for automatic field submission. Easy peasy! But what if I do not want to share my data for that particular transaction? No worries, one's consent will always be sought every single time MyInfo is used for any government transaction. Additionally, I can choose to be alerted whenever a digital service uses my personal data. Just how great MyInfo is a life hack for a busy parent like me? What it means: No more tedious form-filling and no more data entry errors. Relevant data fields will be filled in automatically, making it faster for me to complete online forms, and with fewer mistakes. What it means FOR ME: More time to spend with the monkies, like wrestling on the bed - Tsum Tsum style! What it means: Verifications via physical documents are no longer needed to complete transactions. Upon my consent, government-verified information can be submitted on my behalf, freeing up precious time! What it means FOR ME: Fuss-free and most importantly, stress-free because I do not have to fret about digging for past forms to submit. I win! What it means: MyInfo adheres to the same security standards as SingPass, and consent is always obtained before data is transferred. What's more, I will receive notifications whenever I consent to the use of my MyInfo profile , and am able to review records of my past transactions in my user profile. What it means FOR ME: Peace of mind, knowing that I control the sharing of my information and that it will be there when I need to use it. With that extra bit of convenience that MyInfo offers, I can now avoid the hassle of having to wrestle with paperwork. This adds up - not only can I get more done, but I also have pockets of time to re-connect with my loved ones and do the things that I love. For more information and to sign up, visit www.myinfo.gov.sg.